On Sunday morning I led worship at Trenton United Church while the congregation's pastor, our son Isaac, was on "vacation." It's hardly a holiday to move into a new home, but that's what his family was up to. Our Prayers of the People included those from the Humboldt Saskatchewan Broncos junior hockey team who died or were injured in a horrific bus crash on Friday. I also prayed for the families and friends of the players and the clergy who would be leading a prayer vigil that evening, an event which attracted 5,000 people in a community of 6,000. The youth of the casualties, and the images of a small town in mourning, and the heartfelt identification by thousands of sports parents has resulted in a national outpouring of support. The Go Fund Me page has attracted more than six million dollars, one of the top five fundraisers from that source ever. Homes across the country had hockey sticks left outside their front doors as a touching tribute. On Monday the relentless media coverage continued, and I commented to Ruth, my wife, that as understandable as this is, there are bus accidents which occur in other places all the time which barely get noticed, even though they are tragic. There is something about relative proximity and the sense of personal connection which makes all the difference. 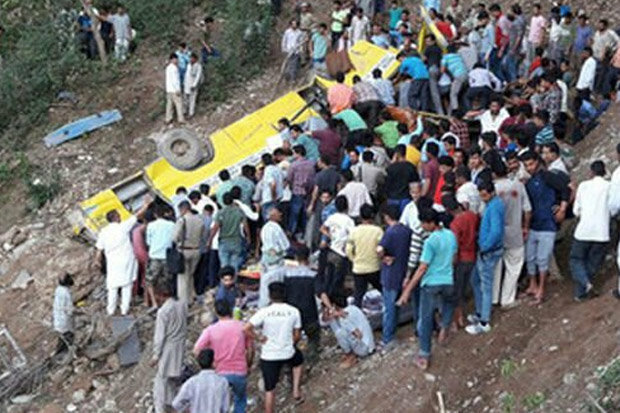 Later in the morning we were informed that a busload of school children careened off a cliff in India killing 27 kids and three adults. This too is a terrible loss of life yet we don't respond in the same visceral way, or at least I don't. Maybe it's because of distance. Perhaps it's low-grade racism. Tragedies like this happen all the time "over there." I don't want to admit that this could be a factor in my response, but it might well be. We can continue to pray for the recovery of the young men who are recovering in Saskatchewan hospitals and for those in the grip of grief. We can also be vigilant in our prayers and generosity for those who "over there," regardless of race, creed or colour. I often have the same thoughts - dozens of people killed in this country or that country that, while obviously tragic, don't have the same impact on me. Over the last 6 months, I've done some business travelling to a couple of countries I never thought I would visit. They have both had their share of tragedy - relentless terrorism in one case, and civil war in the other. Now when I hear about these countries in the news, especially if something bad has happened, I feel differently about it. I imagine the impact it has had on the wonderful people I worked with over there. Those countries no longer feel so distant to me.